There is always a risk in entering Bach’s universe, given the technical difficulties of the scores but also because of the effort of attaining the spiritual, emotional and, if desired, the transcendental environment the Cantor’s music requires if it is to be performed with its fair guarantee of authenticity and stylistic rigour. 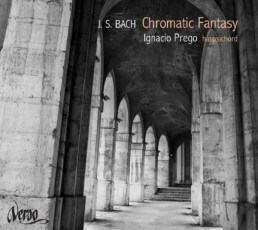 This is indeed the case with the young harpsichordist Ignacio Prego who, playing a French instrument, a recent copy inspired by two instruments by Blanchet (1763) and Taskin (1768), offers what may be considered to be one of the most brilliant and emotional versions of the vast Chromastische Fantasie und Fuge BWV 903. The splendid programme is completed with memorable scores such as Toccata BWV 914, Partita BWV 826 or the beautiful Capriccio sobre la lontananza del fratello diletissimo BWV 992, a work of great melancholy composed as it was to farewell the composer’s older brother, in 1704, contracted to the court of Charles XII of Sweden as oboist in the band of the guard of honour. A magnificent letter of introduction from Prego in the select and always demanding world of the Baroque harpsichord. Toccata in e-mol BWV 914: I.
Capriccio sobra la lontazanza del fratello dilettissimo BWV 992: II. Capriccio sobra la lontazanza del fratello dilettissimo BWV 992: IV.